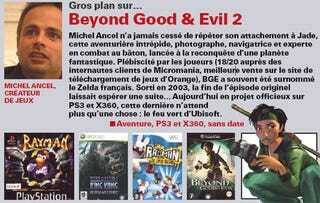 We first posted the news of a sequel to Beyond Good & Evil being in pre-production last night. Since then, though, we've been able to take a good look at the original source of the news, an interview in French magazine JeuxVideo, and glean a few more bits of info from it. Firstly, the interview wasn't just with Michel Ancel, it was with Yoshitaka Amano (Final Fantasy artist) and French comic artist Enki Bilal, which is pretty cool! Secondly, Ancel says the game - if it's ever approved by Ubisoft, that is - will be for the PS3 and 360. Sorry, N-Gage fans. But it's better you know now than to keep on hoping in vain.